All around the Las Vegas landscape there are palm trees, and lots of them. When it comes to summertime, palm trees and swimming pools are a pair which can make any afternoon great. A considerable number of homeowners choose to have palm trees around their home because of the tropical look they give a somewhat desert landscape, and when planted in the right areas they can produce some welcome shade. A lot of this comes from lush plants which are well tended for and are healthy. This comes with lots of carefulattention, and if this isn’t carried out on a routine basis, a palm tree will begin showing yellow and brown foliage which is the sign of an unhealthy tree. There are specific issues which can arise with palms, and these are easy to spot. Here are three things you should keep your eyes open for. Yellowing Leaflets – When you examine older fronds and see they are turning yellow, it means there is a magnesium shortage. When this happens, it can quickly turn lush green foliage to yellow. Yellow or Orange Spotting – This is caused by a lack of potassium which is shown on the older fronds. (The ones lower down the tree). It can also lead to the trunk of the tree becoming narrow. Scorched Fronds – You might spot newer fronds that appear scorched, and it is the sun. However, this is signs of a manganese deficiency. This can also cause these new leaflets to start curling. If your palm trees receive the wrong amount or type of fertilizer or a lack of feeding they can quickly reach a stage where it isn’t possible to save them, and they will promptly die. Las Vegas Tree Removal Pros have seen numerous palm trees go this way when owners were unsure what the cause was, and just put it down to harsh weather. The secret to your palms receiving the correct fertilizing is maintenance, and with this, they will maintain their lush foliage. When you want to fertilize your palm trees, it is better to include this as part of a maintenance package. Over-fertilizing can be both a waste of money, and it can hamper the growth of your tree as much as not having enough minerals. Las Vegas Tree Removal Pros look at the condition of the entire tree as well as just adding the correct amount of fertilizer. From planting in the best area and in the properwayto giving advice on watering, and cleaning and trimming of taller plants. 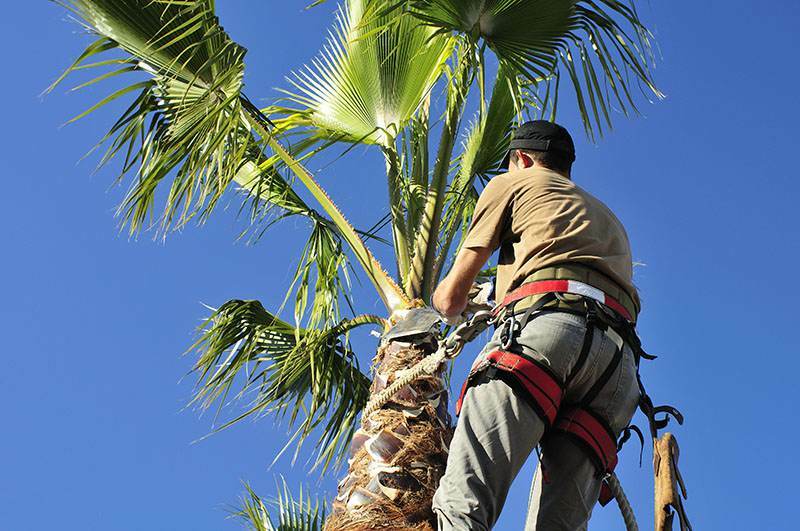 Our pros are the best in Las Vegas and provide the same number one service for many other palm tree owners. A quick estimate is all it takes to make sure your palms are well catered for.